Got a rodent problem? Or, more specifically, a mouse problem? Even if you're one of those people who think mice are cute, here's why you'll want to get rid of them: mice are destructive, gnawing their way through everything from food packaging to electrical cables; they are incontinent, urinating constantly and leaving up to 80 droppings a day around the house; they breed rapidly, with a single couple able to produce up to 200 (you heard us) offspring within a year; and they harbour parasites that can spread diseases, including salmonella, meningitis, encephalitis and tapeworms to us. Convinced that you want to get rid of your home's mice – and fast? Find out how to get rid of all sorts of household pests. Then see all our cleaning how-tos and hacks to keep your home sparkling. Before you start, it's worth knowing that it's not that easy to get rid of mice once they're in. So, if you've noticed one mouse just the once, and you take the measures suggested below, you might be lucky and knock the problem on the head quickly. If you're just getting round to sorting an on-going mouse problem, you may find that the only way to get rid of them is to call in professionals. Droppings are your biggest clue – they're not big but they're likely to gather in one particular area, which will be where your mice are finding food. That's not the only sign, though. Look for where mice have gnawed through anything from furniture to food packaging. Start by mouse-proofing your home – in other words, stop them getting in. There might be some obvious cracks around door frames, drainage pipes, across an airbrick or drains that you can block up, but you should know that mice can squeeze through the smallest of gaps – if you can fit a pencil into the crack, a mouse can get through it. Where airbricks are the only obvious point of access, fixing a fine wire mesh across them might slow them down. Otherwise, use steel wool and caulking to block gaps and cracks – or weather strips around doors – mice will chew through plastic, rubber and wood pretty quickly, so keep an eye on any previous fixes you've made. Bear in mind that gaps in floorboards mean that mice beneath the house can get up into ground floor rooms, too. How to get rid of mice? Buy more than you think you'll need – at least six. Ideally you want to catch all of the mice in the first few days, rather than let their population build up. Now to the traps themselves – and this might take some stomaching. Snap traps with glued down bait might see off a light infestation, but laying glue traps or poisonous traps might be needed for bigger invasions. Electronic mouse traps will kill the mice quickly and (some would say) humanely. There are also humane mouse traps, where the mouse is trapped in a little cage to await release – but, of course, you have to be confident that the mice can't get back in if you don't want your infestation to continue. If you are using live traps, make sure you release the mice as far away from your home (or anybody's home, for that matter) as possible. If you are going to use a poisonous trap, ensure they're in sealed bait stations, that the stations are behind or under furniture (ie, out of reach of children/pets), that you only use the poison indoors (ditto), that you wear disposable gloves when handling it, that any extra poisonous traps are stored out of reach, and that you wash your hands after use. If you do lay traps, lay plenty of each different type to up your chances of catching the mouse/mice. And bear in mind safety issues if you have other pets or small children. Mice run along walls, so putting the traps next to the walls, with the trigger section facing the skirting board, will mean they run straight to the bait, ensuring they're more likely to be captured properly. Putting them behind furniture is a good idea, too. Place the traps in the rooms where you've seen the mice (or droppings) – they don't tend to stray further than 3m to 6m from their preferred food source. Move the traps about the space every couple of days – rats will avoid them but mice are nosey. Check the traps at least twice a day to remove trapped mice quickly. If you can't bear the idea of setting traps, you might like to try a natural method – although they're likely to be less effective, giving the mouse population more time to build up. Still interested? Mice apparently dislike some strong smells, with peppermint, moth balls, ammonia and cat litter both known to be deterrents. Tumble dryer sheets are another option – try stuffing them into cracks or laying them around the areas they've been known to visit. Mice don't need much food to survive – just a few crumbs here and there will keep them going every day. So, if you want to get rid of mice, vacuuming food from floors, wiping down surfaces and cleaning out cupboards will discourage them in the first place. This cleanliness, it goes without saying, extends to their droppings too. 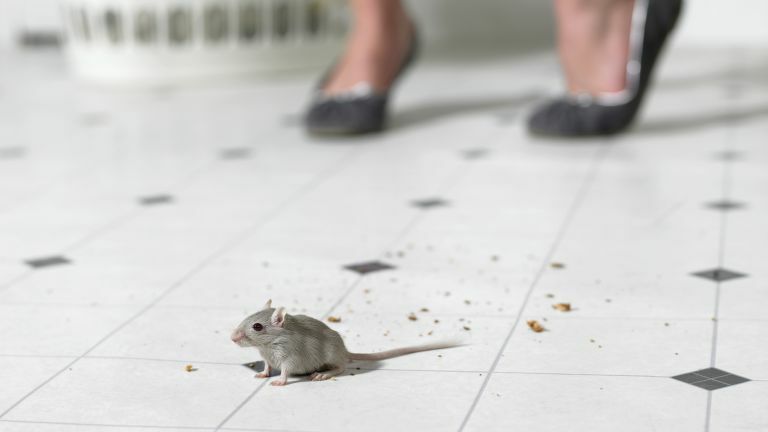 But cleaning up mouse droppings quickly isn't just about hygiene – the presence of droppings (or lack of them) is the biggest clue you might get as to whether you're still living with mice. Storing food that's likely to leave crumbs in lidded, sturdy containers – we're thinking cereals, bread, rice, cake, biscuits – will cut down on mice infestations. Don't leave food waste in open bins (kids are particularly guilty of this kind of behaviour) and ensure your household rubbish, and particularly food bin or recycling, is protected by a fixed lid. Don't forget, plastic bags won't be enough to keep them at bay. If your home is surrounded by lots of foliage you might, inadvertently, be providing mice with handy places to hide and nest. Lining the gap between the house and the foliage with a heavy layer of gravel will discourage burrowing, but regularly checking around the outside of the house to remove debris and weeds – and nests if you find them – should mean the mice go elsewhere. Keeping the garden neat, front and back, will make it easier to spot nests in future. Cats hunt mice – and while you don't want to encourage your cat to be bringing their prizes home to show you, they will discourage the mice from entering in the first place. Some dogs, terriers in particular, will even get in on the action – and will at least alert you to the presence of a mouse. So if you want to know how to get rid of mice and gain a new family member, this is it. If you've tried everything (perhaps, bar the cat) above and you're still seeing mice indoors, it's time to admit defeat before the problem really gets out of hand.